Happy Friday! I'm sure you'll enjoy this weeks Bloggers Challenge - Product Focus, use Dies or Punches on your project. I saw a cute layout idea in the Holiday Mini (which began mailing this week) on page 8 using Berry Christmas. I didn't order that set, but in it's place used Circle Circus and Tree Trimmings - both from Stampin' Up! The Top Note was cut from White Card Stock, then cut again from a small piece of Soft Suede, which was adhered to the bottom of the White panel. The sentiment is from Teeny Tiny Wishes stamped in Red using a SAMJ. I used the SAMJ to stamp the Ribbon, and to also align the ornaments (circles from Circle Circus, ornament from Tree Trimmings). The ornaments were stamped a second time, cut out and popped up on dimensionals over the first image. All items are available through my website. For more inspiration on using Dies or Punches in your projects, be sure to click on the Bloggers Challenge Logo on my sidebar. Have a great weekend! I'm heading to the Scrapbook Expo in St. Charles IL on Saturday, hoping to run into a few friends there! 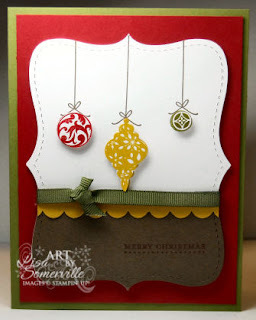 Extremely cute card, love the ornaments, die cut, scallop punch. Colors and composition are fabulous! I like the way you combined the scallop border punch with the top note! Also super smart to use Circle Circus as ornaments! Very cute card, Lisa! I like the way you substituted circles for ornaments! cute, cute, cute! Love your thinking on using the Circus set for the ornaments. Very cute card! Great used of the Circle Circus. Wish I could join you on Saturday!!! What a neat idea...I have not purchased any new SU products..but this one is calling my name.. Awesome job and thanks for posting this challenge. Very Festive! Love the ornaments. That TOP note die works great in so many styles of cards. This is my favorite card so far! I've been trying to figure how I'm going to use these images and you've done it for me! Way too cute! Fabulous layout. It works perfectly with the ornaments (love the ones using Circle Circus). Love how you used Circle Circus here, Lisa! So pretty! Very clean and elegant! You've given me new life for my Cirlce Circus ..... what a great card. Very CAS! Elegant and beautiful, this card REALLY appeals to me! Wonderful job with the challenge.. Love it!!! This is too cute!! Love how you used a non christmas set and made it christmas!! love it! !